The growing awareness on hygiene in the area of hotels, restaurants, and catering sector world over is a key trend driving the evolution of the away from home tissue products market. A sustained focus on the importance of hygiene and sanitation across communities in public places such as hospitals, hotels, and offices is a primary factor that has propelled the demand for different away-from-home tissue products such as napkins, toweling, toilet papers, facial tissues, and sanitary napkins. In several developing and developed regions, the adoption of active prevention measures against a number of diseases, notably contagious ones, has boosted the demand for these products as they are found to be more effective than traditional hand dryers and cloth towels. Substantial technological advances in the packaging machinery and the advent of more affordable and environmental-friendly products are recent developments favorably impacting the market. 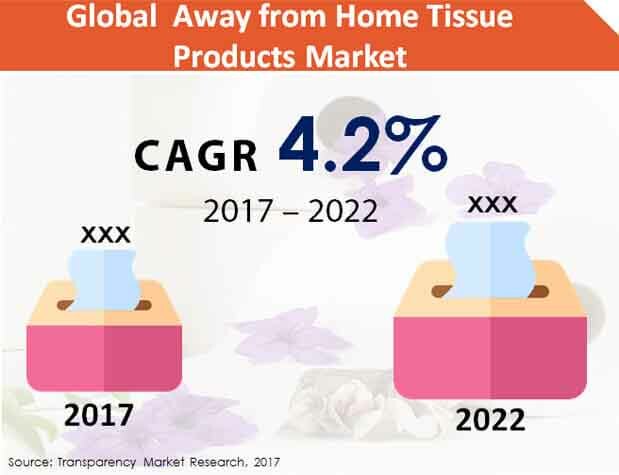 The global away from home tissue products market is projected to rise from a valuation of US$25,566.3 Mn in 2017 to reach US$31,449.9 Mn by end of 2022. The market is forecast to rise at a CAGR of 4.2% from 2017 to 2022. The rising focus on hygiene, sanitation, and comfort in the area of healthcare, hospitality, food service, and retail is a key factor driving the demand for various away from home tissue products. The growing demand for better protection products against contagious diseases in hotels and catering services, commercial institutions, healthcare institutions, and public places is bolstering the adoption of away from home tissue products. A burgeoning hotels, restaurants, and catering sector, coupled with improving consumer spending in several developing and developed countries, is a prominent trend accentuating the market. The intensifying demand for environmentally preferable options and recyclable napkins and facial tissue products is a key factor expected to fuel the away from home tissue products market. The advent of tissue products in various sizes, weight, and color in order to meet the specific criteria of end users is a key factor accentuating the market. However, the availability of lower quality away-from-home tissue products is a notable factor likely to hamper the market in some regions. In addition, a low hotel room occupancy in some countries still recovering from the adverse effects of global recession of 2009 is also likely to affect the profitability of players. Nevertheless, the rising demand for towel and tissue products in the food service industry has opened up lucrative avenues for market players. Geographically, currently North America is the leading market holding the major revenue share in 2016. However, Asia Pacific excluding Japan (APEJ) is projected to rise at major CAGR during 2017–2022 and outpace North America by contributing the leading revenue of US$8,841.4 Mn by the end of 2022. The growth is expected to be fueled by a rapidly rising demand for away from home tissue products in the hotels, restaurants, and catering sector, especially in several emerging economies. Of all product types, the toweling segment is anticipated to dominate the market in 2017 and is expected to hold the major share of 45.3%, by the end of the forecast period. A number of established players are focused on offering higher-quality recyclable hygiene products to meet diverse needs of end users, especially in workplace, healthcare and hotel environments. Emerging players are focused on launching affordable products in order to gain a competitive edge over others. Some of the leading players operating in the global away from home tissue products market are Kimberly-Clark Corporation, Georgia-Pacific LLC, Svenska Cellulosa Aktiebolaget, Cascades Inc., Procter & Gamble Co., Sofidel Group, Weifang Lancel Hygiene Products LTD, Asia Pulp and Paper, Kruger Inc., and MPI Papermills.